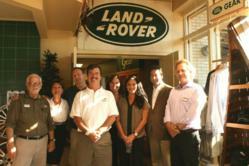 On June 18, 2013, Bill Jacobs Land Rover Hinsdale hosted the Hinsdale Chamber of Commerce Business After Hours event where business owners were able to meet in a casual and fun environment to make new friends and catch up with old ones. The time honored tradition has allowed Hinsdale’s business community to stay in touch, network, and to just enjoy some friendly and relaxed downtime. The Chamber of Commerce is a group of retail, professional and business people banded together as an organization to promote the economic well being of our community, as well as to foster ethical business practices. In order to maintain a prosperous and attractive business district, it is necessary that such an organization should exist. The Wine & Cheese After Hours event was held on Tuesday evening from 5-7pm at the Land Rover Hinsdale location, 300 East Ogden Avenue, and many new and returning business owners were able to enjoy one another’s company with a helping of wine and cheese on the side. For further information about the event or to learn more about Bill Jacobs Land Rover in Hinsdale, please visit http://www.landroverhinsdale.net. As one of the largest Land Rover dealerships in the Chicagoland area, Bill Jacobs Land Rover has served Illinois loyally with over 50 years of experience in the automotive business. We pride ourselves on delivering a level of customer satisfaction beyond your expectations, backed by a friendly name you can trust. In keeping with the Bill Jacobs tradition, we promise to provide a customer-friendly purchasing experience and a responsive and reliable experience in our service department as well. For additional information, please visit us today at 300 East Ogden Avenue, Hinsdale, IL 60521 or by calling (866) 857-7638 and visiting our website at http://www.landroverhinsdale.net.